We were delighted to welcome Mr Chris Thomas, School Games Manager for Rutland to our assembly on Monday 19th November. Mr Thomas presented the school with our Gold School Games Mark Award, which the children were very excited about. The award recognises all the hard work the children and staff put into P.E. and School sport in the 2017/2018 academic year. Our next challenge is to hold Gold for 5 year and move up to platinum level! The School Games Mark is a government led awards scheme launched in 2012 to reward schools for their commitment to the development of competition across their school and into the community. Participating in this process allows schools to evaluate their PE provision and assists them in developing an action plan for future progress. For more information, please follow the link below. 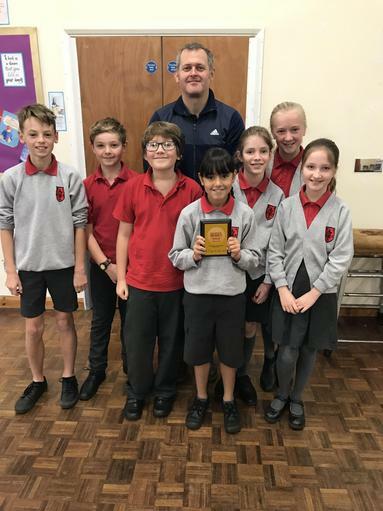 Below is a photograph of this year's Year 6 School Sports Crew, which includes our Bronze Sports Ambassadors as well as journalists, equipment monitors and the media team. We look forward to seeing what they will have to offer us over the next year.